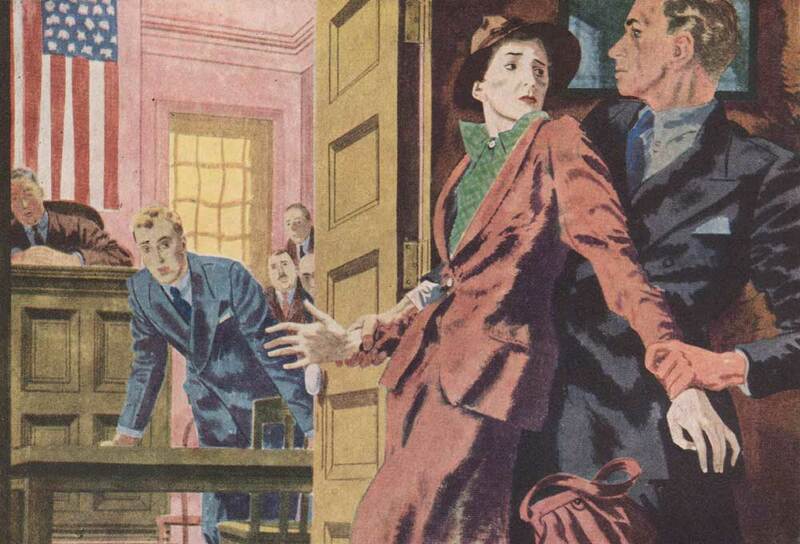 Robert Fawcett is justifiably called an illustrator’s illustrator. 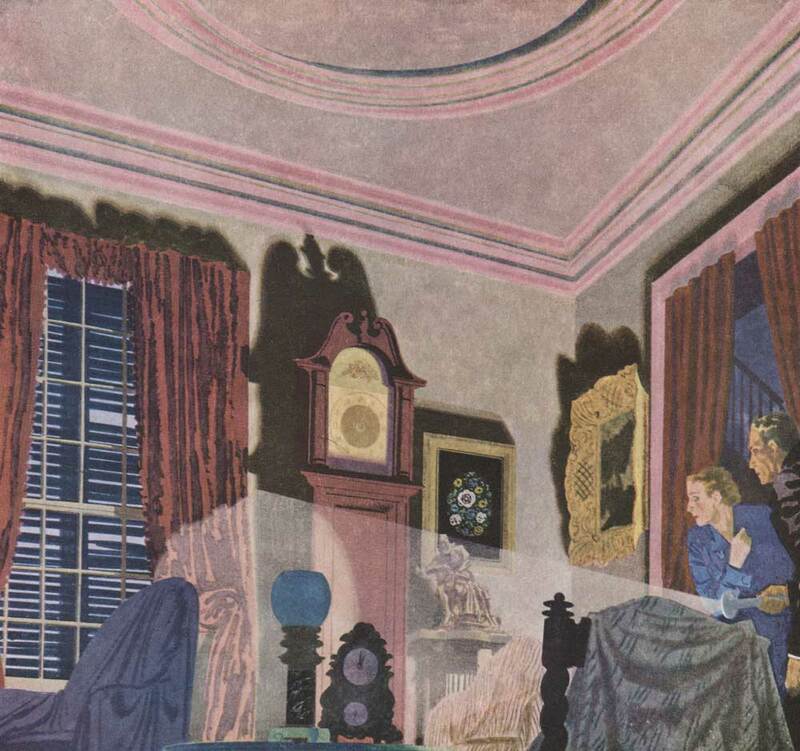 He was born in England, raised in Canada and later lived and worked in the U.S. His career took off in the 1940s and 50s as a top illustrator for magazine publishers. He later became one of the original founders of The Famous Artist School. While he wasn’t the most illustrious name in the field or the richest, Fawcett was regarded by his peers as the consummate professional and artist. 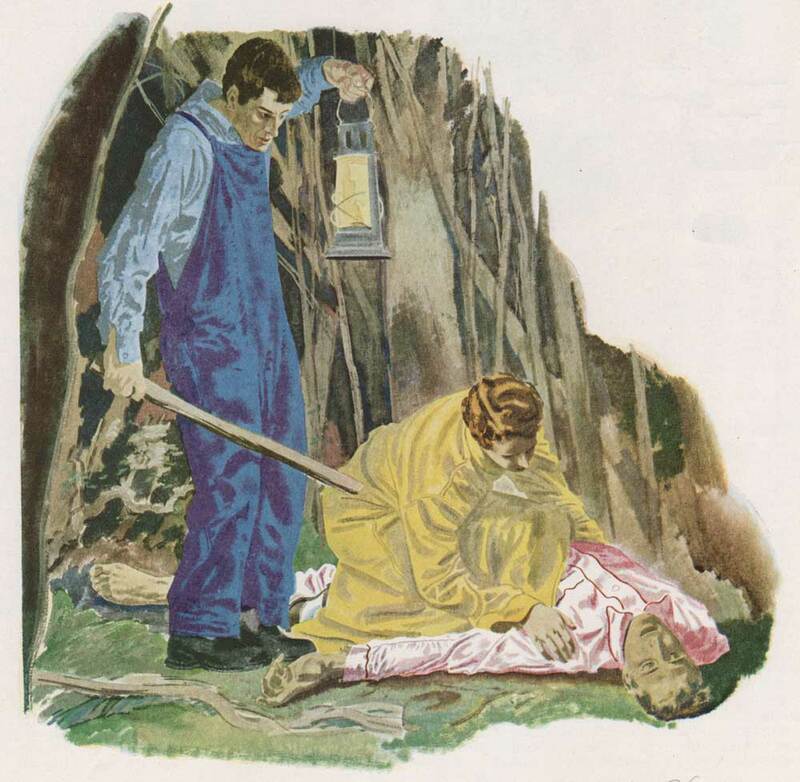 A collection of Fawcett’s illustrations for mystery stories follows. His drawings were meticulously researched and rendered in great detail. They set the stage for readers, luring them into the story. 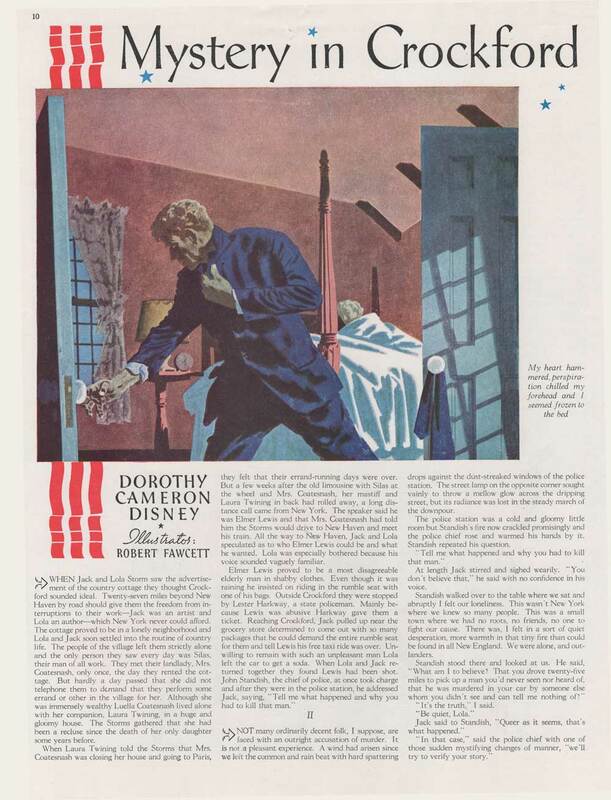 His work is legendary for a series of Sherlock Holmes tales in the early 1950s for Colliers. 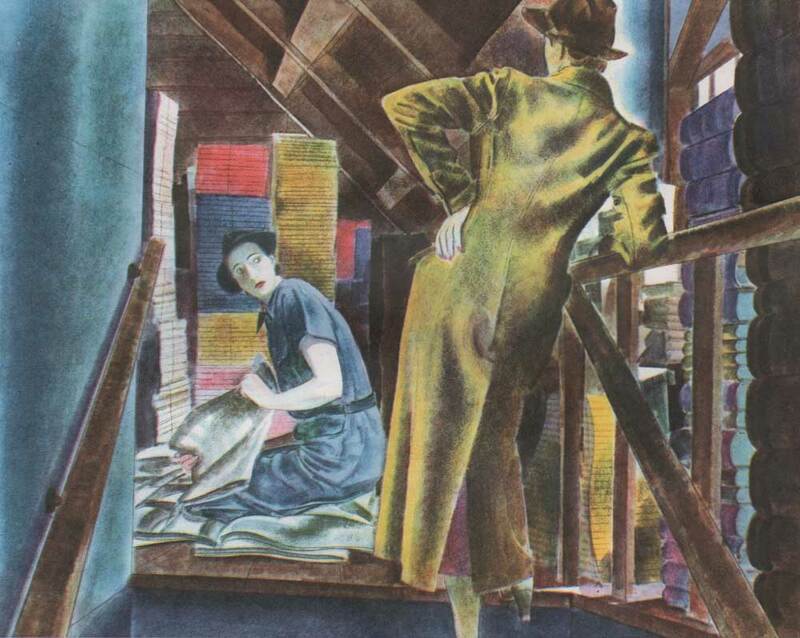 He also illustrated magazine stories for writers like Agatha Christie, Ngaio Marsh and Dorothy Cameron Disney. 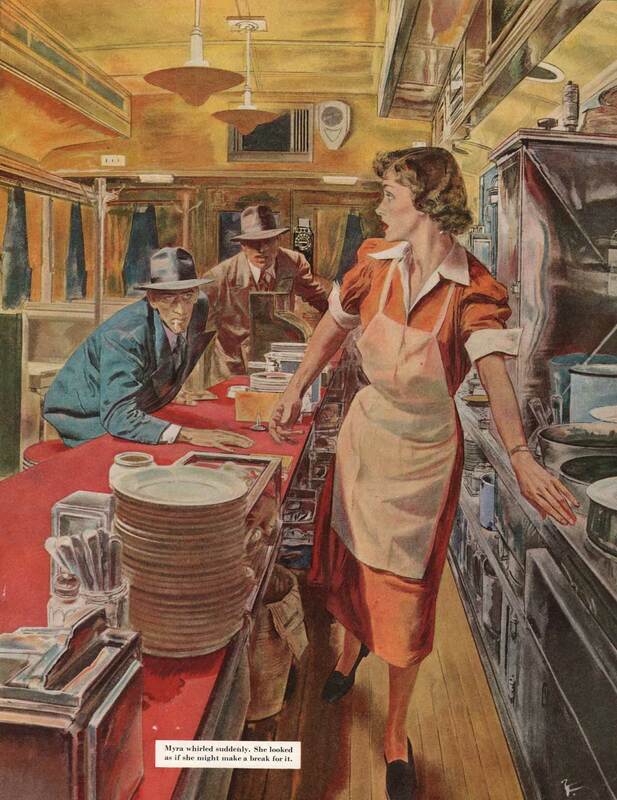 A color spread done for Colliers in 1956. 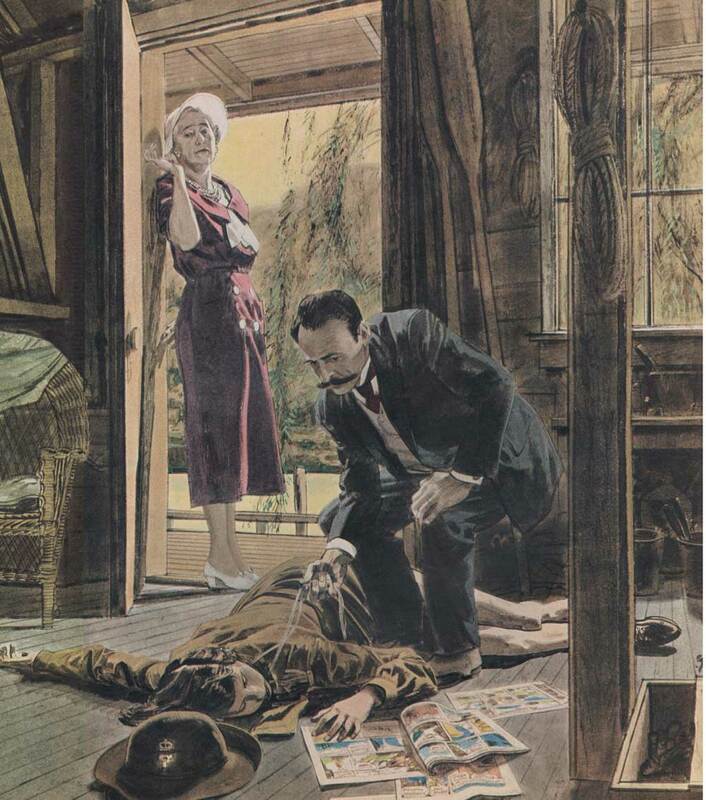 Dead Man’s Folly by Agatha Christie featured Hercule Poirot, here examining the victim lying on the boat house floor. The artist was trained at the Slade School of Art in London, drawing strictly from the figure for two straight years. His illustrations show a mastery of perspective that an architectural artist would be proud of. It was all self-taught through acute observation. 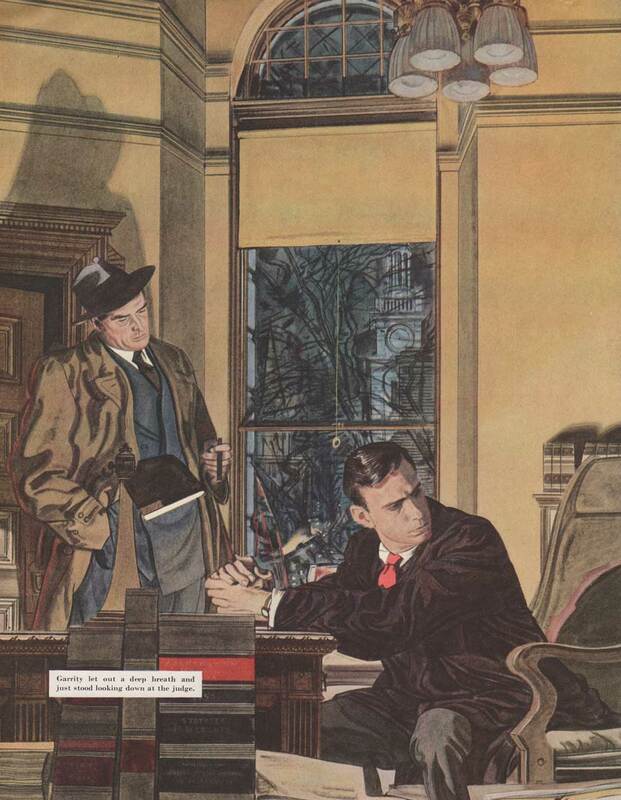 An investigator questions a judge in a Saturday Evening Post story from 1952. Note the architectural detail inside and outside. The shadow on the wall adds to an air of foreboding. From a 1953 story in Colliers. 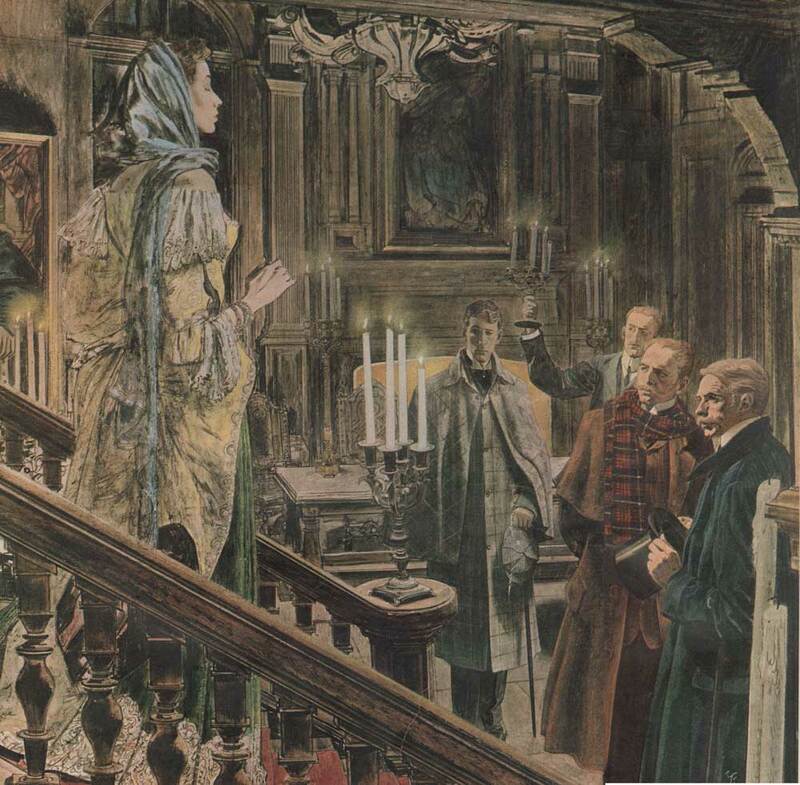 A murder suspect descends the stairs as Sherlock Holmes looks on with Watson and law officers. The architectural details of a baronet’s mansion lend an air of authenticity to the 1800s setting. Fawcett stages a final scene gathering all eleven suspects together as Hercule Poroit lays out his theory of the case. 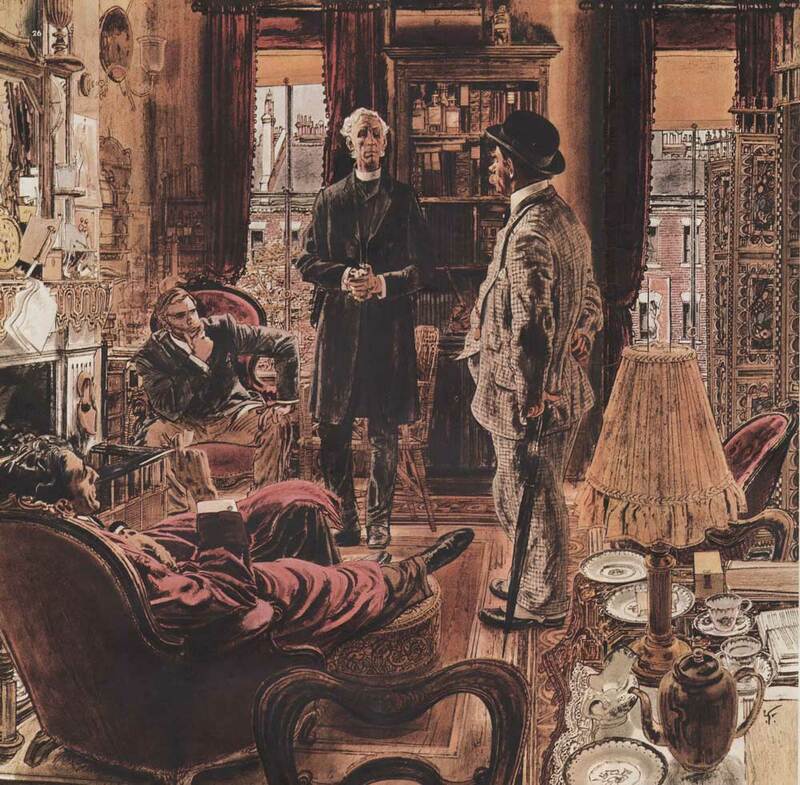 One of the artist’s classic Sherlock Holmes spreads from 1953. Fawcett pictures the great detective’s lair in all it’s cluttered glory. His attention to the London architecture outside is typical of the research he did. For the definitive work on Robert Fawcett I recommend “Robert Fawcett: The Illustrator’s Illustrator” by David Apatoff, published by Auad Publishing in 2010. But good luck finding it. The book has not been reprinted and copies on the net are scarce and expensive. I’m currently digitizing hundreds of Fawcett tear sheets and will be able to offer a flash drive with all I have gathered. In the not too distant future, I hope. In the meantime beg the publisher and author to go to press with a second printing. There are fans waiting. 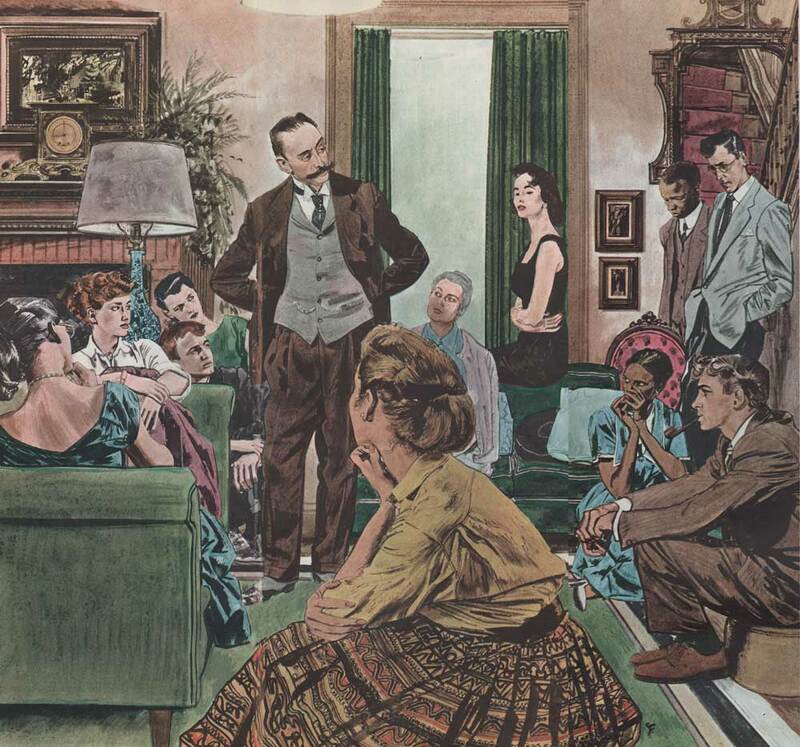 In upcoming posts I’ll cover some of Fawcett’s adverting illustrations and his 1960s reportage.